Over the past 15 years, strong growth in optoelectronics has been fueled by several different product categories at different times. Laser transmitters for high-speed optical networks were a major growth driver before the dot.com implosion in 2001. Image sensors and lamp devices (primarily LEDs) became star performers in the last decade, and more recently, laser transmitters have re-emerged as a major growth driver in optoelectronics. High-brightness LEDs (HB-LEDs) have reached the luminous efficacy of fluorescent lights and are in a position to be a major factor in the $100bn global lighting industry. Since the end of the last decade, strong sales of HB-LEDs have gone into backlighting systems for cellphones, tablets, LCD TVs, and computer displays, but this growth has greatly eased with penetration rates reaching nearly 100% in these applications. With production capacity growing, HB-LED suppliers are concentrating on cutting costs and improving the overall quality of light for general illumination products in homes, businesses, buildings, outdoor lighting, and other applications, such as automotive headlamps and digital signs. HB-LED 2014 -2019 CAGR forecast (sales): 9.7%. CMOS image sensors have entered into another wave of strong sales growth as digital imaging moves into automotive-safety systems, medical equipment, video security and surveillance networks, human-recognition UIs, wearable body cameras, and other embedded applications beyond camera phones and stand-alone digital cameras. 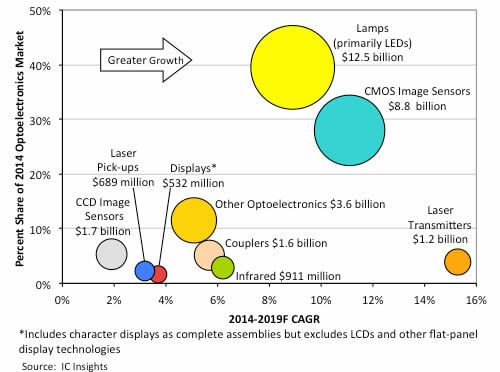 CMOS image sensor 2014-2019 CAGR forecast (sales): 11.1%. Fibre-optic laser transmitters will continue to be the fastest growing optoelectronics product category as network operators struggle to keep up with huge increases in Internet traffic, video streaming and downloads, cloud-computing services, and the potential for billions of new connections in the IoT. Laser transmitter 2014-2019 CAGR forecast (sales): 15.3%. A snapshot of the optoelectronics market, based on % market share and forecast 2014-19 CAGR. In a one-of-a-kind study, IC Insights continues to expand its coverage of the semiconductor industry with detailed analysis of trends and growth rates in the optoelectronics, sensors/actuators, and discretes market segments in its 360-page O-S-D Report - A Market Analysis and Forecast for Optoelectronics, Sensors/Actuators, and Discretes. Now in its 10th annual edition, the 2015 O-S-D Report contains a detailed forecast of sales, unit shipments, and selling prices for more than 30 individual product types and categories through 2019. Also included is a review of technology trends for each of the segments. The 2015 O-S-D Report, with more than 240 charts and figures, is priced at $3,290 for an individual-user license and $6,390 for a multi-user corporate license.